This car I've seen many times by San Diego Volvo dealership. Wouldn't it be better/easier to swap a stock turbo intercooler setup in and upgrade from there? I have only come here seeking knowledge. Things they would not teach me of in college. Last edited by LC4CARL; 08-16-2017 at 05:16 PM.. There are slight variables, but generally speaking it's the size of the housing/turbine. My neighbor has sublet a room to an old man for the last few years. Great guy. Total motor head. We talk over the fence a few times a week. He gave me a ride in his 928 a while ago. Awesome. So cool. I can remember the first time I became aware of these cars. Car and Driver magazine showing the new car at some show in Europe. "Risky Business" with Tom Cruise. And, years later, while Mom was ferrying us around in our C10, I saw my first 928 turning off I-75 onto Vienna road. Growing up two hours north of Detroit, it was too much. Wow. Well, my friend is moving on. Going to Texas to be with his brother for a while. Would I be interested in the Porsche for $5000. Gulp. Uh, wow. It's a nice example. Some desirable upgrades. But it does have it's problems. Images of me behind the wheel of a Porsche... Oh, man. Flip up head lamps, V8 power... Crap. The 245 is now our "big" car as the wife drives the MINI. But I do have access to the company SUV for short trips to the lumber yard. 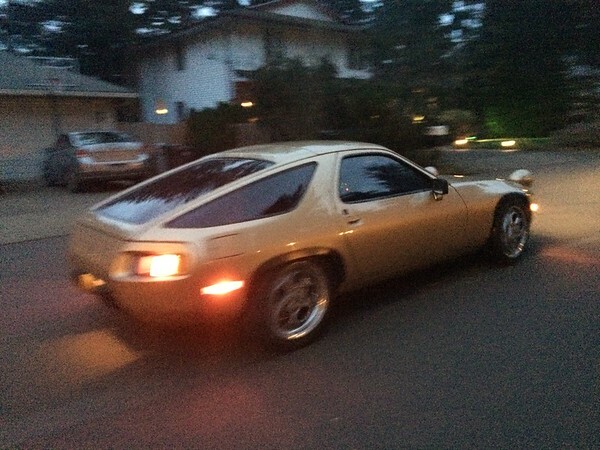 The 928 would likely be ungodly expensive to maintain. I like to tinker, but this car looks pretty complex. And then there is TB to consider. As I've said before, part of the 245's appeal is access to all my friends here. And I think I would miss that. Is the steering wheel still on? I'll just say that it's a "real car" vs a "box of dissimilar parts, more or less working together." Which is not a reflection on 240's in general, but of my particular JY special. Not that I don't enjoy JY specials. Hard to argue. Always preferred the 911. Post up some pix of your latest efforts! I read through this entire thread (took me 2 days). Looking back on why I did this, I like how you tackled one issue at a time and learned your way through the car (and still learning, god help you with the dash out). Learned a few things, can never know enough about these cars. I actually had this same care (a white 240 wagon), and had a similar experience where I started with not much and ended up with something I was proud of and trusted. I actually sold it for as much money as I had into it (that never happens, could not pass up the offer). All that being said, I want to point out something important. If you end up moving to DC or wherever the move may be, dont just dump the car for 1500 on CL and call it a day because its convenient with your move. Store it behind if you cant take it and worry about it later (3m, 6m down the line). Or drive it there (risky, hard on time with your family). I would recommend sending it on a trailer perhaps with a carrier company. 500? 1000? Hold onto it, don't make any quick decisions. The sentiment with this base model DL is quite special. I'll store it for you. By the time you get it back it will be scrapping the ground pushing 350whp and painted. Thx. I put it in my "Plus T" folder. Hey, thanks. Great insight / much appreciated. As my family will attest, I have long struggled with hanging on to stuff. I've had dirt bikes, loved them but run out of time to play, and sold them. Had hot rods, broke them and run out of money to fix them, and sold them. I don't seem to do well with things that sit around. I'm aware of the defect (impatience) and am working to address. The DL has been good, as access is good (out in the garage or chatting on TB) and the cost reasonable. I would love to do the coast to coast road trip in the car. Camp in the back. Take the roads less traveled. That would be awesome. My perception is that most non-car (normal?) people don't put much value the satisfaction of improving a car then driving it someplace. While the trip and the destination are vital, the thrill of using something you fixed is more so (to me). Soo, going forward. I still have a "list" of stuff to fix. And winter busyness is just around the corner. But I am conscious of the fact that I will need "direction" for the next stage of Volvo fun. Now that she's approaching reliability and functionality, what next? Fix the body? Plus T the motor? T5 trans? The heater effort has reminded me that the task should (when possible) be interesting / fun. I've been at low point with the car as I soldier on with (or flat ignore) a task I don't enjoy. I live vicariously through your skills and motivation. Let's put my car on air this winter. How much would that be? More than your Wife will be willing to overlook. A salient point to be sure! Unless you break the cardinal rule "only one not running vehicle at a time", break that and your prowess moves its a$$ to the couch. True words being spoken here.